Deepavali is the annual Festival of Lights. People light many little wick lamps and celebrate the victory of light over darkness, good over evil, and knowledge over ignorance. The highlight this week was the Deepavali celebration. This festival has multiple aspects, the primary being the celebration of light over darkness, a.k.a., good over evil, knowledge over ignorance. There was a beautiful worship ceremony (puja) to Goddess Lakshmi, who is the goddess of prosperity, virtue, purity. Swami Tattvavidananda gave a profound lecture on a short hymn/prayer called Devi Stuti. Click to read it. And the day concluded with pretty significant fireworks right here on the property. The struggle between “good” and “evil” is predominant in Hindu scriptural stories (Puranas). It symbolizes our inner struggle. I remember some cartoons in my childhood where suddenly the cartoon character would have a devil on one shoulder and an angel on the other, each one of them talking to the character about what to do next. Do you remember that? An interesting point made by Swami TV (as we affectionately call Swami Tattvavidananda), was that usually the bad characters in the stories are stronger than the good ones. He humorously noted that this is why many of us end up with pot bellies (our desire for sense gratification wins over our dedication to healthy diet). So many scriptural stories have good guys who just can’t defeat the bad guys despite their best efforts. Then what happens? What do they do when the come to their wits end? They pray to God for help. In Ramayana scripture, Rama comes to help. In Mahabharata scripture, Krishna comes to help. In Devi Mahatmya scripture, the Goddess comes to help. They pray with a humble heart, their ego surrendered. Then do they sit back and relax to let God or Goddess do all the fighting? Do they become surrendered couch potatoes? No. No at all. They continue to do their part the best they can. They do their duty according to the circumstance as best they can, all the time trusting in the Divine, trusting that whatever ends up happening is for the best, and ready to accept any outcome as the work of providence, even if it is not the outcome they were aiming for. It’s one thing to have a goal. It’s another thing to be attached to a particular outcome. Surrender of attachment is immediately followed by peace of mind, and isn’t that what we all really want? P.S. The other big thing this week was the commencement of live streaming of the classes (for $3.49 per class). 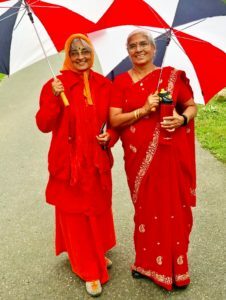 Check it out at: www.myarshavidya.org/live. The class schedule is listed below the video window. Freedom cannot be demonstrated by any outer circumstance. Freedom is an inner experience which is available in all outer circumstances, when attachment/aversion/ego are abandoned. True freedom is freedom from all compulsion. How to become free of attachments and aversions? 1) See the defects in the objects of attachment. See the virtues in the objects of aversion. 2) Do what is right regardless of what you like. 3) Practice all virtues. Do unto others as you would have them do unto you. Sometimes you come to a moral dilemma. In such cases, you have to choose the greater dharma for the greater good, even if a lesser dharma is violated. These two ladies were walking in the opposite direction on the walkway. They looked so colorful, I asked if I could take a picture.